SparkPost is a cloud email platform that offers reliable, secure, and ultra-fast email delivery services that scale. 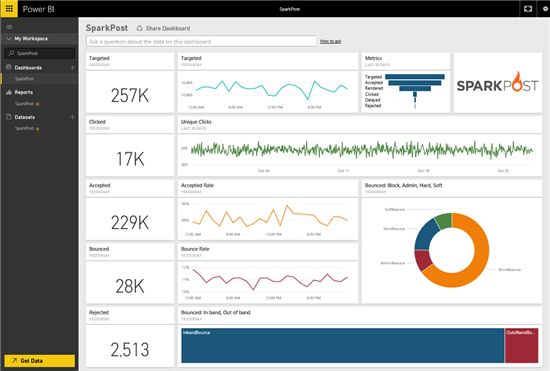 By connecting Power BI with your existing SparkPost account, you’ll be able to use the Power BI SparkPost content pack to monitor, explore, and visualize your activity. 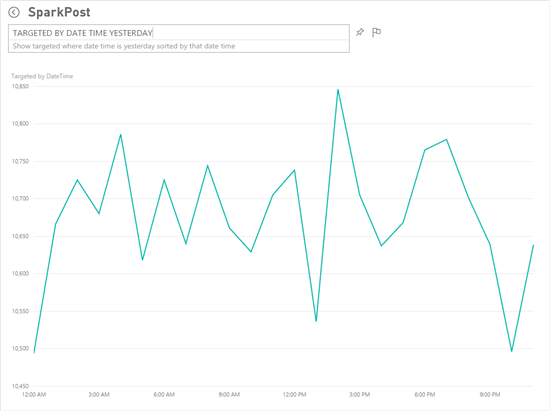 The content pack allows you to easily connect your SparkPost data and begin to discover insights with the out-of-the box dashboard, reports, and curated data set on Power BI. This post will explain how the Power BI content pack can help you analyze your SparkPost data. 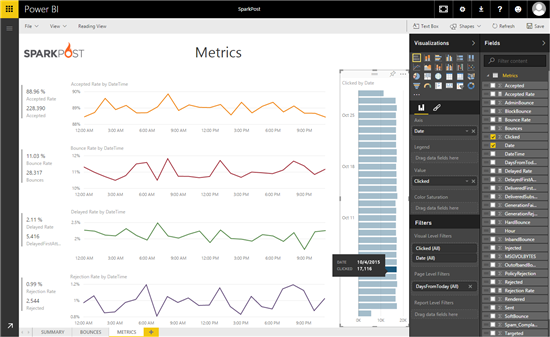 For additional details on how to get started, please see the SparkPost content pack for Power BI help page. After connecting with your SparkPost credentials, your data will begin loading into Power BI and you will be notified when the dashboard is ready. In addition to the dashboard there are three reports that you can drill into by selecting one of the tiles on the dashboard. The reports provide additional insight into bounces and other key metrics. To begin drilling into the reports select one of the tiles on the dashboard. For example, if you select the Accepted Rate line chart it will drill into the Metrics report. Each report includes a set of visuals with different insights. For additional information you can hover over any of the items, or select a particular value to cross filter other visuals on the page. The Metrics report allows you to see key metrics and the activity for the last 30 days. If you select an a specific date on the right side of the report, the visuals on the page are cross filtered for that date rather than the 30 day period. You have the ability to customize the report by selecting Edit Report in the top left corner of the page. The edit mode gives you access to the field list, allowing you access to any of the values included in the data set. It also gives you the ability you to edit or add visuals to your reports. Any of the visualizations from the reports can be pinned to the dashboard by hovering over it and selecting the pin icon. You can also ask a question of your data. Not sure what to ask? Try selecting the question box at the top of your dashboard. A list of relevent questions for the dataset will be shown. Selecting the first suggestion shows you the number of targeted emails sent yesterday by hour. You can customize the question (instead of “yesterday”, try “last week”) or start asking something different. Each answer can be pinned to the dashboard using the pin icon next to the question box. After the initial import, the dashboard and the reports continue to update daily. You can control the refresh schedule on the dataset. 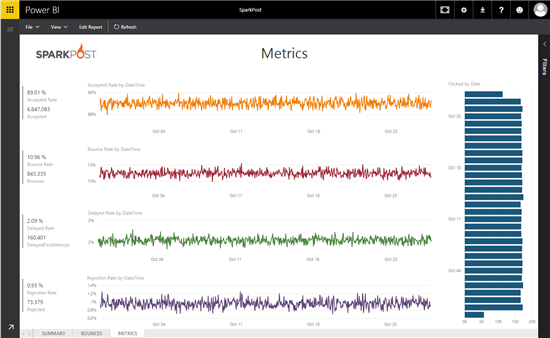 With SparkPost content pack for Power BI, you have an initial set of metrics and insights enabling you to explore your data even further. We’re always interested in hearing your feedback; please contact us at http://support.powerbi.com to let the team know how your experience was and if there’s anything we can do better. We look forward to your feedback!